Daniel James Walton is an American former Major League Baseball outfielder. 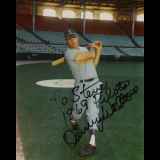 He played for the Houston Astros, Seattle Pilots, Milwaukee Brewers, New York Yankees, Minnesota Twins, Los Angeles Dodgers, Yokohama Taiyo Whales, and Texas Rangers. During a 9-year major league baseball career, he hit .223, 28 home runs, and 107 runs batted in.